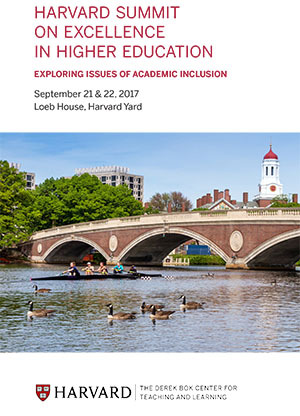 Rooted in the relevant national conversations of the past year, the 2017 Summit will focused on issues of inclusion, primarily issues of academic inclusion with recognition of personal and social factors as well. Below we have the 2017 Summit Agenda, an Executive Summary of the Summit, a Summary of Speaker Resources and videos of the sessions. PANEL ONE: What Does Inclusion Mean for Our Campuses? PANEL TWO: What is Our Responsibility to Our Students? Speakers: Joanne Berger-Sweeney, Jonathan Holloway and Rebecca Graves-Bayazitoglu.